Ben Fritz writes: Only for Marvel could this seem like a less-than-superheroic opening. “Avengers: Age of Ultron” opened to a phenomenal $187.7 million in the U.S. and Canada, according to studio estimates, the second-biggest debut of all time. But many in Hollywood were surprised it came in 9% lower than the record set three years ago by the original “Avengers,” which also opened the first weekend of May and kicked off summer moviegoing season. 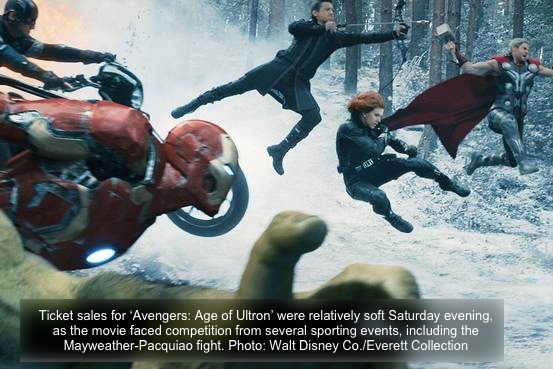 Saturday night’s boxing match between Floyd Mayweather, Jr. and Manny Pacquiao, along with the Kentucky Derby and NBA and NHL playoff games, undoubtedly depressed grosses a bit for “Age of Ultron,” from Walt Disney Co.’s consistently successful Marvel Studios. What’s not yet clear is whether the decrease in ticket sales indicate any audience weariness for Hollywood’s accelerating pace of big-budget “event” films. The movie industry is expecting a blockbuster summer at the box office, thanks primarily to highly anticipated sequels such as “Jurassic World,” “Mission Impossible: Rogue Nation,” “Ted 2” and “Minions,” as well as Pixar Animation Studios’ “Inside Out.” If even a portion of the population is growing tired of such films, that could be bad for major studios. In good news, however, there are no signs of fatigue overseas. “Age of Ultron” has collected $439 million internationally after opening in many countries last week. Compared with the first “Avengers,” it has grossed 7% more in U.S. dollars and 31% more in local currencies in the same markets over the same period of time, said Dave Hollis, Disney’s executive vice president of distribution. The most successful foreign country is South Korea, where the “Avengers”sequel has grossed $55.4 million. Part of the movie was shot and takes place in that country. This weekend, “Age of Ultron” set a record for the biggest opening of all time in Mexico, with $25.5 million. It has yet to open in China, where it is likely to be a huge hit, although studios receive only 25% of box-office revenue in that country. In the U.S., Disney is expected to get about 60% of ticket sales, while theaters keep the rest.